Entrepreneurship and Cluster Dynamics focuses on the origin and development of clusters and specifically on the role played by the strategic entrepreneurship in these contexts. 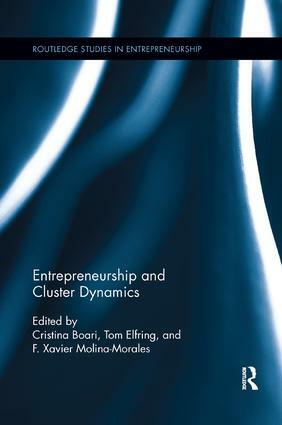 Although separately entrepreneurship and cluster studies have already attracted the attention of academics and practitioners; this book aims to go further and offer an integrated and interactive view of topics. The cross-cutting approach is one of the main attributes of this book. In fact, the book involves a great range of organizational and economic perspectives, from social psychology to conventional applied economics disciplines. Moreover, these topics allow the use of different levels of analysis, from the individual entrepreneur behind a start-up to the structure of cluster networks, including the organizational levels. An analysis of the change and development of clusters going further than traditional functional approaches by examining how entrepreneurs and their actions are not only influenced by the cluster but also shape the cluster development, will offer an explanation of how entrepreneurship and networking entrepreneurs can foster, perhaps also inhibit, cluster development and change. Finally Entrepreneurship and Cluster Dynamics theorizes about the role of the strategic entrepreneurship in developing start-ups inside already established companies, which can play the role of broker in the cluster. Entrepreneurship and Cluster Dynamics offers a unique opportunity to academics, researchers, and students to learn about relations and interactions between entrepreneurship and cluster perspectives, providing both newly and original theoretical propositions and also rigorous conclusive empirical exercises. How Do Networks Evolve During the Advanced Stages of the Cluster Life Cycle?